Painting a driveway is usually considered a big job, Waterworx Pressure Cleaning & Driveway Painting Ipswich are experts. Driveways looks great when they are new that’s probably why there is always so much of it around to clean & paint. Concrete painting large areas can be daunting & very time consuming! 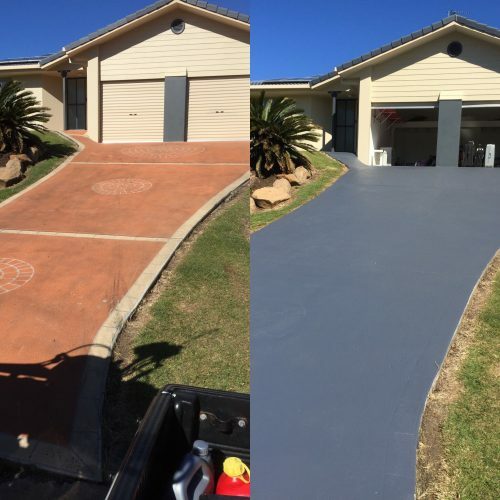 Because of its light colour, concrete can become very unsightly very quickly particularly in SE Queensland with warmth and high humidity. Concrete is a very porous medium and harbours moisture and dirt promoting the growth of mould ( the black colour you see ). Because of its deep pours it produces mould fast, so pressure cleaning and a special chemical treatment is needed to prepare the surface before painting. Waterworx Pressure Cleaning makes Driveway cleaning, painting and sealing straight forward because we have the right equipment to clean paint and seal driveways. High powered commercial pressure cleaners used with environmentally friendly concrete cleaning treatments are the only sure means of preparing your driveway before painting or sealing. If all of this is starting to sound like anything but fun, then you are starting to get the picture of what it takes to clean & paint concrete. This is why it’s better to avoid this type of DIY project. Make is easy for yourself and enjoy life by contacting Waterworx Pressure Cleaning & Driveway Painting Ipswich who are properly equipped and have the experience and training to do the job and save you the time and effort. Regardless of whether its a massive factory, a driveway, a storage area, patio or big commercial factory, Waterworx Pressure Cleaning & Driveway Painting Ipswich, have the expertise, skills and capacity to deal with the work for you. Your house is your home and as a result you always want it to look at it’s best. CALL Waterworx Pressure Cleaning & Driveway Painting Ipswich on Ph 0422 814 168 or complete our free quote form below. Some of the common questions asked by our customers about driveway painting. Q . What are the benefits of driveway painting ? Q. When should a driveway be repainted? A. There are many colours to choose from our extensive Dulux colour chart. Q. How long before I can park on the drive or garage once paint is applied? A. You can walk on a driveway after a few hours. No parking on it for 5 days as heat in tyres will mark the paint badly. Q. What is the process of the driveway painting job ? A. Waterworx Pressure Cleaning & Driveway Painting Ipswich start with a high pressure clean to remove any dust and dirt build up ,Then once the surface is dry we tape up all areas to protect brick work ,skirts etc , we apply 2 coats of paint to areas . remove tape and clean up . leaving it neat and tidy. A. The type of frequency of traffic , along with weather conditions all play a part in how long it will last but we at Waterworx Pressure Cleaning & Driveway Painting Ipswich only use top quality paints from Dulux and give a 10 year warranty on all our work. A. Keep drive way clean , wash with plain water to remove loose dirt, remove any spills quickly with an absorbent cloth. Do not use solvents on surface.